Xataface has supported CSV export since the beginning, but I have recently been made aware that the CSV files that Xataface produces haven't been "MS Excel" friendly when it comes to UTF-8 special characters. You may have noticed that if you export a data set as CSV from Xataface where some records include special characters (like é and å), and try to open it with MS Excel, the characters become garbled. These CSV files work fine with Open Office, Google Docs, and pretty much every other spreadsheet program out there. It's just that MS Excel doesn't seem to support UTF-8 encoded CSV files. (Note: You can still import them into Excel using its import features, where you can specify the encoding explicitly, but if you try to simply open the CSV file with Excel, it will assume that the encoding is Mac Roman or Windows 1252 depending on whether you're on Mac or Windows). Many solutions were tried to try to make these CSV files work nicely with Excel, but it seems that Excel simply can't handle UTF-8! Today I implemented an experimental feature in Xataface to be able to export data to CSV that Excel can handle. It works by using UTF-16 encoding instead of UTF-8 as well as some other settings specifically designed to cater to Excel (e.g. tab delimiter instead of commas, and a different mimetype). 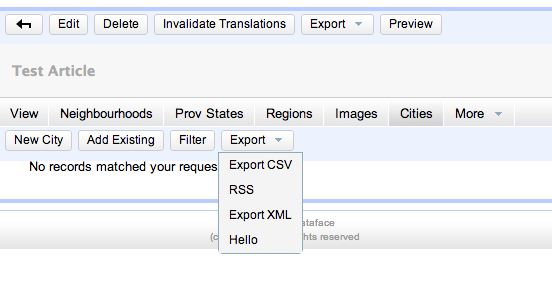 Then you can just use the export CSV action as normal (e.g. 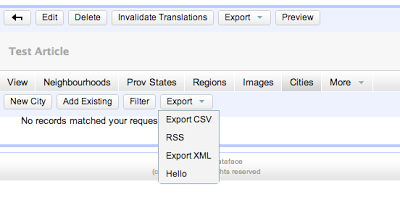 from list view click "Export" > "CSV" if using the g2 theme, or click the "Export CSV" icon in the upper right of the list view if using the default theme). This change is currently in the master repository on GitHub and will be included in the 2.0.3 release. Implementing Blocks & Slots in delegate classes. Configuration directives in the various INI files. All of these strategies have a time and place. Before rolling up your sleeves and delving into templates, blocks, slots, preferences, and the like, I recommend seeing how far you can get with just pure CSS by creating your own custom stylesheet. Using CSS, you can change the logo, hide components on the page, change color schemes, and even modify the layout to a certain extent. Using a modern web browser like Chrome that includes some developer tools, it is fairly easy to peruse the DOM and come up with the appropriate CSS to modify it to your liking. 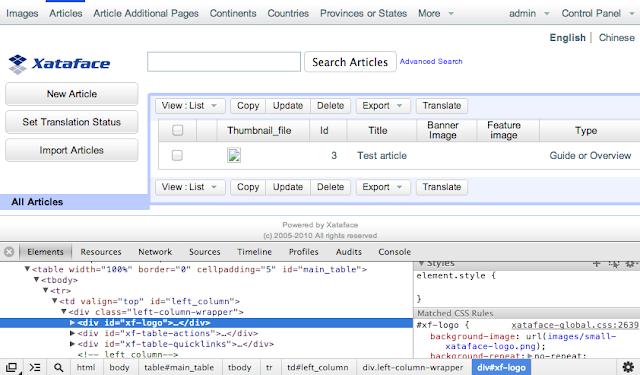 Adding a custom CSS stylesheet to your Xataface application. 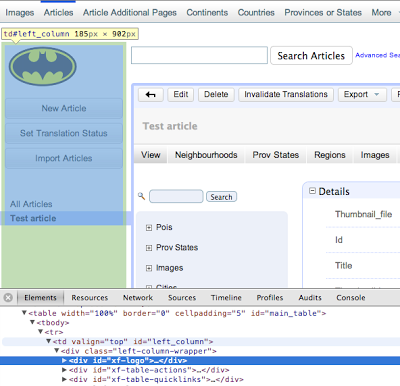 Using Chrome's developer tools to identify the parts of the page that you want to modify or hide. Modifying or hiding portions of the UI that we identified in the previous step by adding CSS rules to our CSS file. We make use of the Dataface_Application class's addHeadContent() method that allows you to embed arbitrary content in the <head> section. 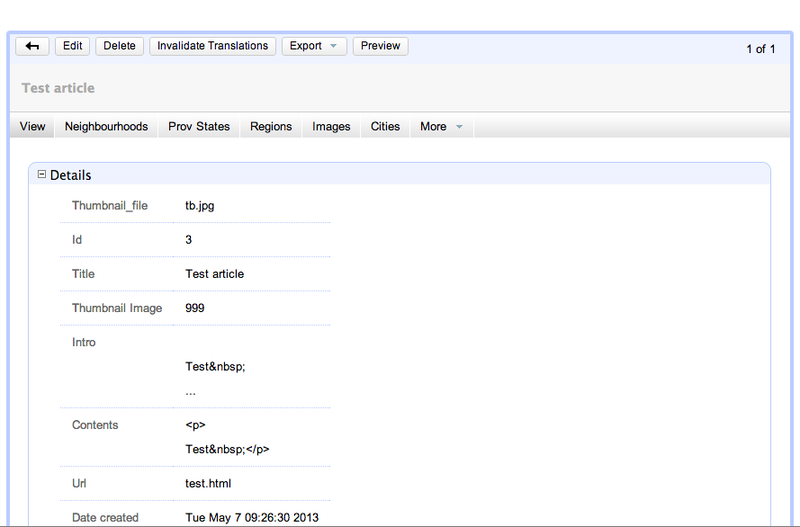 We use it here to add a <link> tag which includes our stylesheet. In this example, I'm using the G2 theme. Instructions for other themes will be slightly different because the logo is displayed in different positions using different methods. 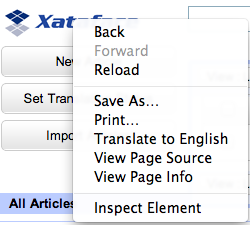 Open your Xataface application in Chrome. 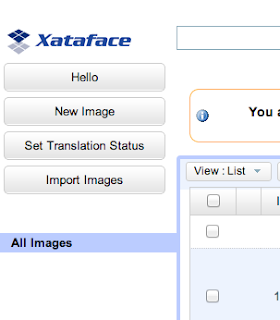 Right click on the Xataface logo, and select "Inspect Element". 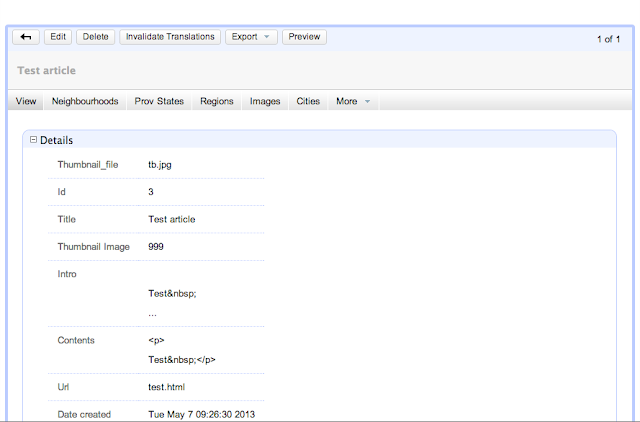 This will open the document inspector so that you can actually see the HTML document tree. If you got here by right-clicking on the Xataface logo, then it should show up with the xataface logo div tag selected. The Chrome element inspector allows you to view the DOM tree. Here you see the xf-logo div seelcted. On the right you can see some of the CSS rules that apply to this element, including the background-image directive which specifies the image file to use for the logo. 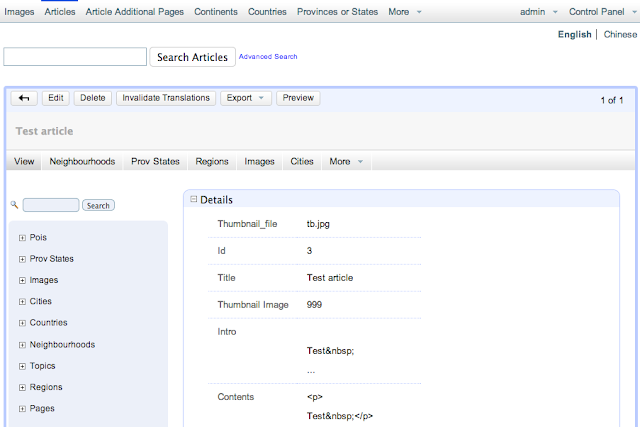 With the xf-logo div selected you should be able to review the CSS rules that apply to that tag. The first matched rule (seen in the lower right of the above screenshot) specifies that the background-image is at images/small-xataface-logo.png. 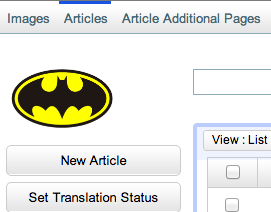 This gives us a clue as to how to craft our own CSS rule to override this background-image. Let's add a CSS rule in our style.css file to specify a different image file. Note that URLs in a CSS file are relative to the location of the stylesheet. Therefore, we need to place our custom-logo.png file inside the "images" directory which should be at the same level as the style.css file (i.e. in the main site directory). You may want to tinker a little more with the CSS to adjust the position of the logo, but we're pretty much there. Another common request is to hide sections of the page that your users don't need to access. Keep in mind that there is a difference between your users not needing to access a feature and not being permitted to access a feature is very important. Never rely on CSS to hide features that the user shouldn't have access to. Use permissions for this. Only use CSS to hide sections that aren't needed. That said, let's take a look at the "View" page for a record, and make some decisions about which parts of the page are necessary, and which parts we want to keep. Let's use Chrome again to inspect the document so we can figure our how to target the left column. 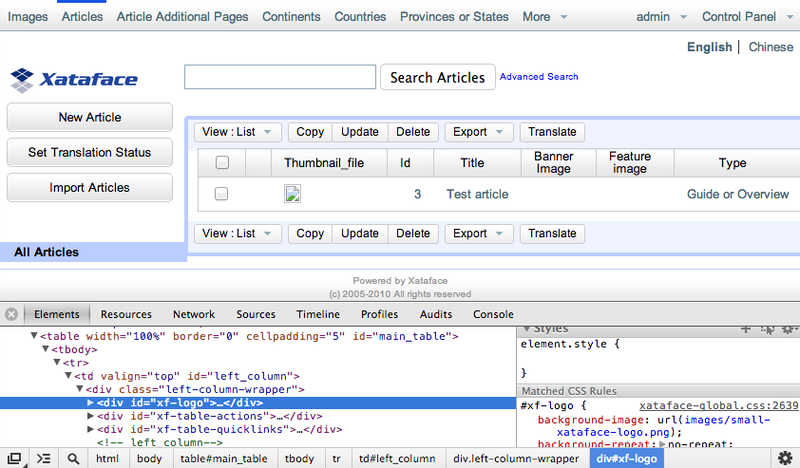 We just need to right click somewhere in the left column and select "Inspect Element" option to open the element inspector. 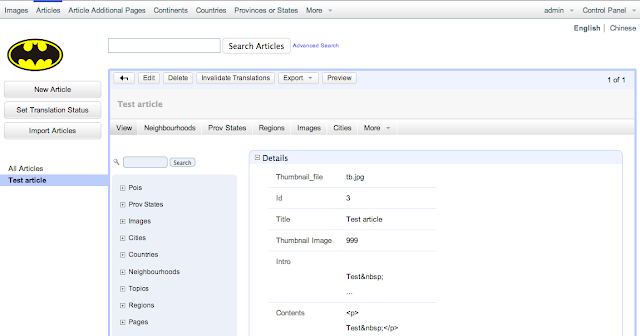 We can then hover over the various tags and see some feedback in the browser panel as the representation of tags on which you hover become selected. Hovering over the left_column div tag in the element inspector causes the left column to appear selected in the browser panel. This allows you to hover around and identify the tags that you want to hide or modify. Now, reloading the page we see that the left column is now gone. With all of the sections removed, we are left with just the portions of the page that we want to display. There is much more that can be done with CSS to customize the look and feel of a Xataface application. We have only scratched the surface here. I'll let you run with it from here to see what your creativity spawns. Suppose you have a "contacts" table in your database that contains contact information of all of your customers or users. It is probable that you intend to contact these by email - e.g. for a mailing list. 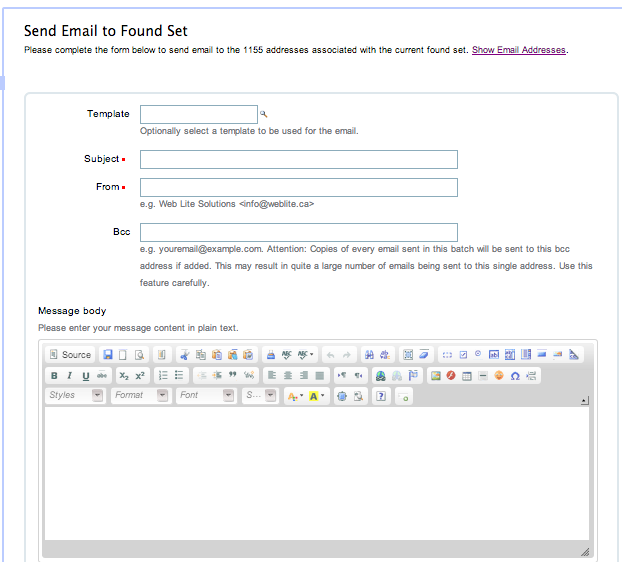 The Xataface Email module makes it a simple matter to use this table as a mailing list. The Email module adds a "Send Email" action to all designated tables that allows you to send email to all records in the current found set. Compatible with all existing found sets. (E.g. 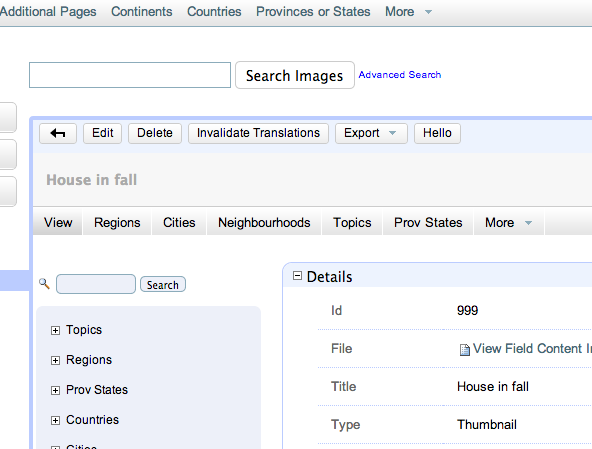 you can perform a search for any subset of rows, and the module will send to the found set). If you don't do this, Xataface will have to try and guess which field to use - and it may be wrong! Now that we have the module installed, let's try to send some email. In our example application, I have a "contacts" table with all of my contacts. 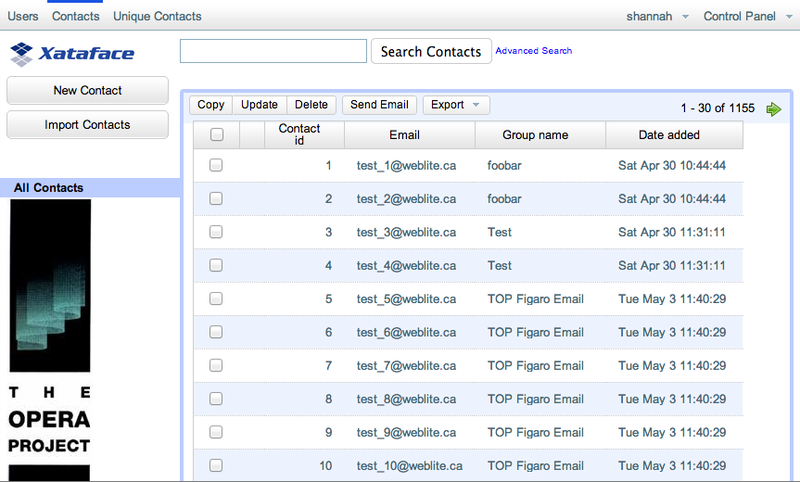 The "List" view for the contacts table. 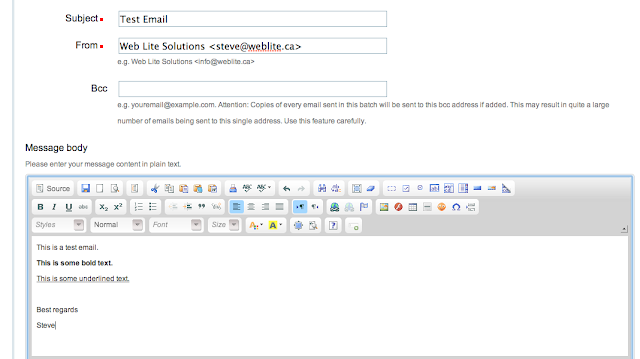 Notice the "Send Email" button, which is present because the Email module is installed and the contacts table is designated as a "Person" entity. The email form. 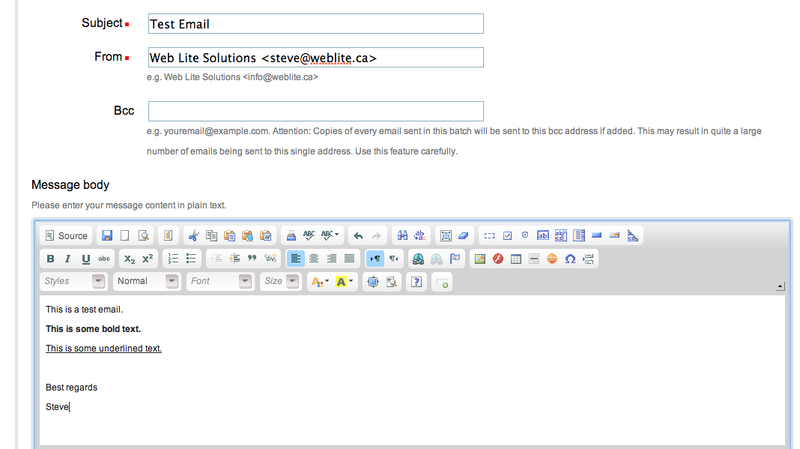 The Message body uses CKeditor to allow you to craft an HTML email in WYSIWYG fashion. Before proceeding with sending the email, you should double check that you are sending to the found set that you intend. Look at the description at the top of the form that says "Please complete the form below to send email to the 1155 email addresses...", and ensure that the number looks right. You should also click the "Show Email Addresses" link to reveal a list of the email addresses that will be mailed. The worst thing you can do is accidentally send an email to thousands of people. If you accidentally click "Send", you can still cancel or pause the email queue at any time - so there are some fail safes in place. 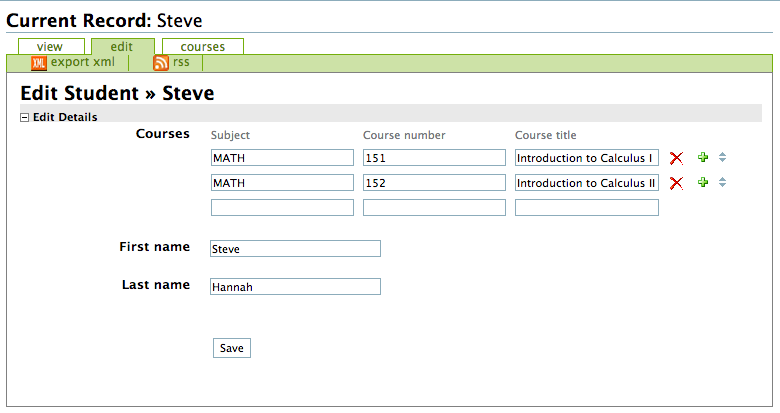 A simple email by filling in the subject, from, and message body fields. 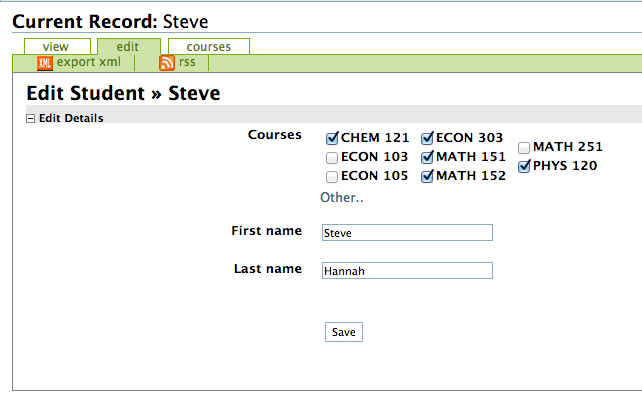 Notice that the "From" field should include the email address in the standard email notation: Name <address>. 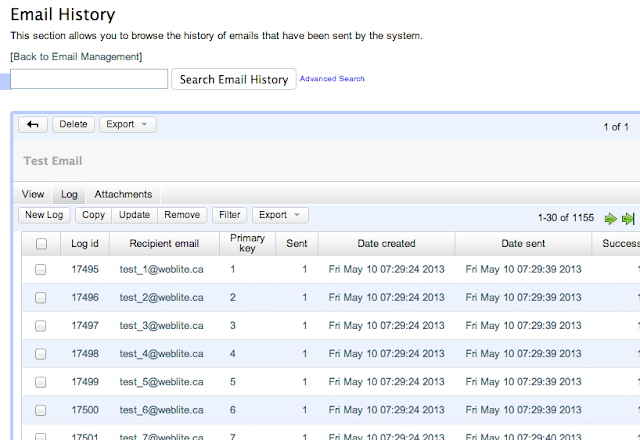 The email history log shows every email that has been sent, along with status information about the Email. Notice that the mailer automatically added a line at the bottom of the email to give the recipient the option to "Opt out" of the mailing list. 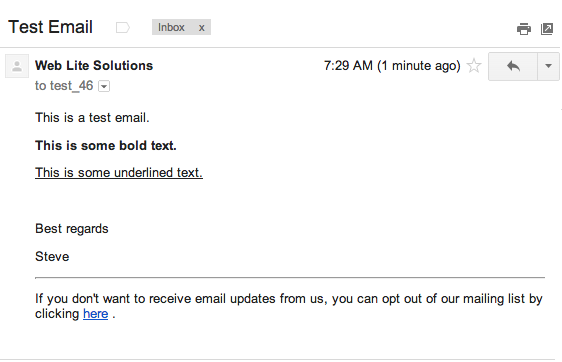 This "opt-out" feature is built into the Email module and is handled automatically for you. 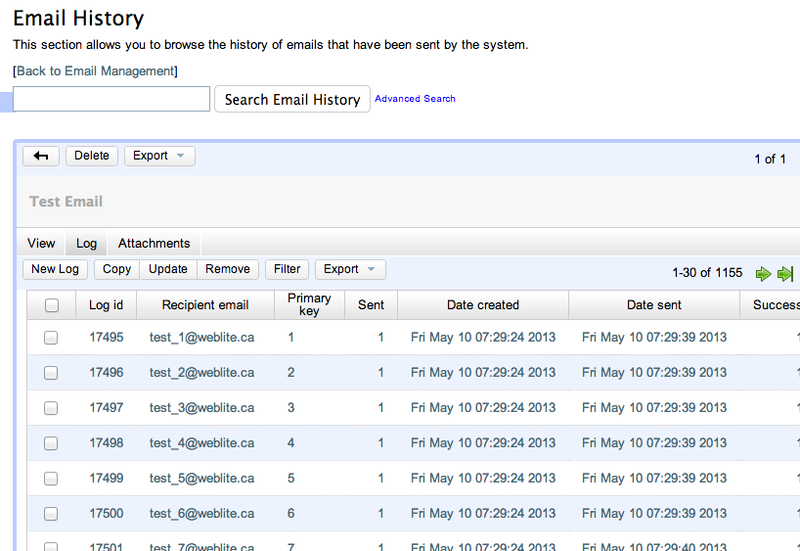 The module keeps a "black list" of email addresses that should not receive email. When a batch email is created, it automatically skips any recipient addresses on this black list (unless you explicitly tell the Email module to ignore the black list on the email form). This form gives the user an opportunity to reconsider opting out. If they are sure that they don't want to receive email from this list, they can click the button on this form. They can opt back in at any time by clicking the same link that is in the email. opt_out_html = "<hr/><p>Click <a href='$url'>here</a> to opt out of our list.</p>"
opt_out_text = "\r\n\r\n----------------------\r\n To opt out, go to $url \r\n"
You can specify any text you want here. Just embed the $url variable in the content where you want the link to the opt-out page to appear. NOTE: As of version 2.1, the g2 theme is installed by default so the steps described in this article are no longer necessary. Modify the core Xataface templates and stylesheets. Create an optional module that overrides the default templates and stylesheets. The default Xataface theme. Notice the tables list on the left and vertical because there are more than 10 tables included in the tables menu. Same page using the G2 theme. Notice the tables listed horizontally along the top. The "More" drop-down menu lists the remaining tables. 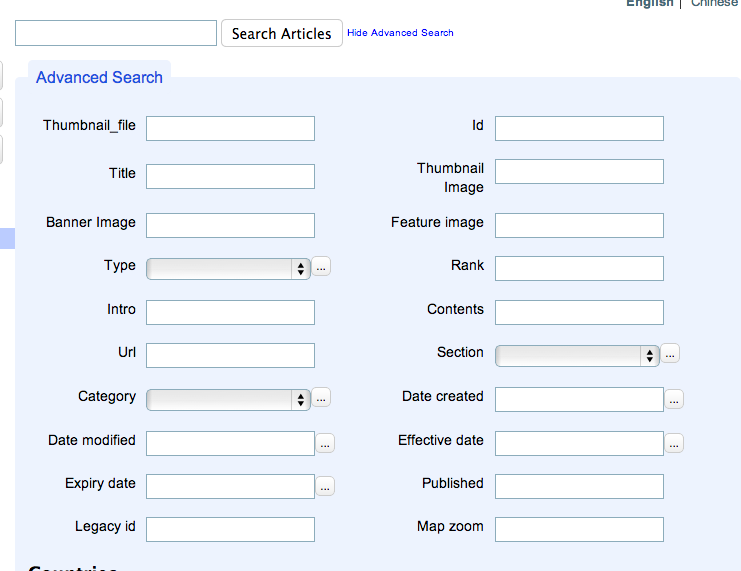 The Advanced find form appears via pull-down. Selected Record Actions. 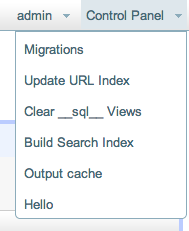 Result list actions are now all dialed in to operate on the records that are "checked" in list view. The list view now shows result list actions across the top and bottom of the list. These all operate on the selected rows (i.e. the rows whose checkboxes are checked). Result controller. The result controller is now less cluttered, and only gives users option to change the "limit" and "start" when they click on the result details. The result list controller is more streamlined. The "1-11 of 11" label is all that appears. Clicking on that displays the pop-up dialog to modify the "skip" and "limit" settings. More actions... Action lists are now limited to 7 actions in a particular category. 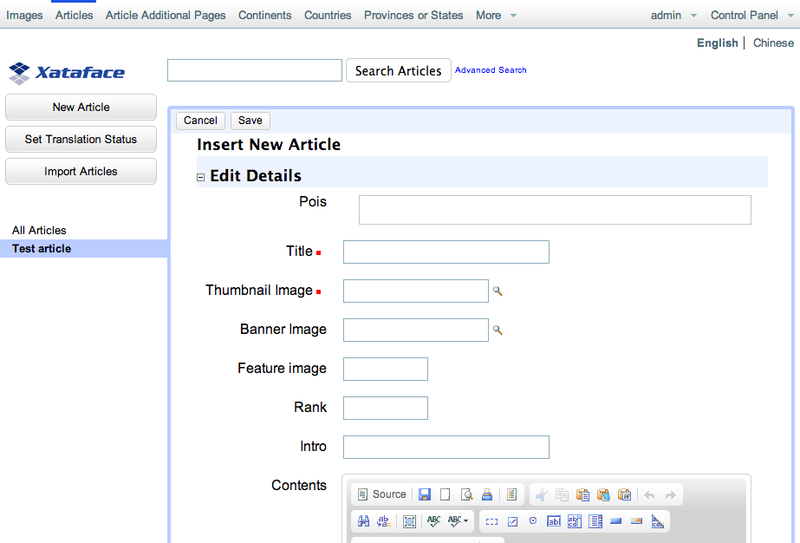 Additional actions, are then included in an 8th "More" drop-down menu. This makes the interface far more extensible when there are large numbers of tables. Now excess tables are listed in the "More..." menu automatically. This is the case with all action groups. Create a "modules" directory in your application if one doesn't already exist. Check out the latest g2 module from the subversion repository, into the "modules" directory. Clean out the templates_c directory to remove old cached templates. 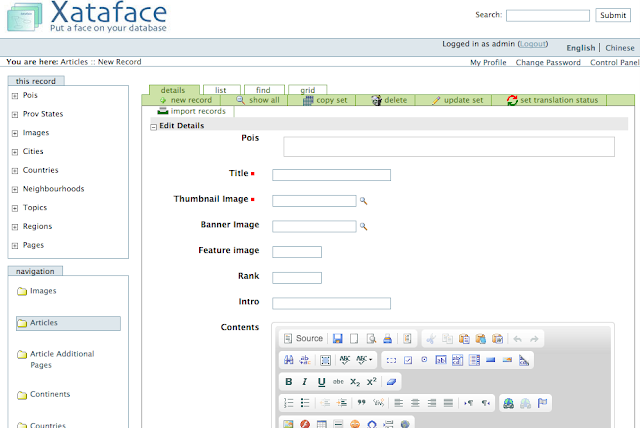 The Xataface tagger widget allows you to add and remove records from a many-to-many relationship with a simple "Tag" interface. This widget is meant to be used with a transient field (similar to the grid widget) so that users can manipulate the records in the relationship directly on the edit/new record form. 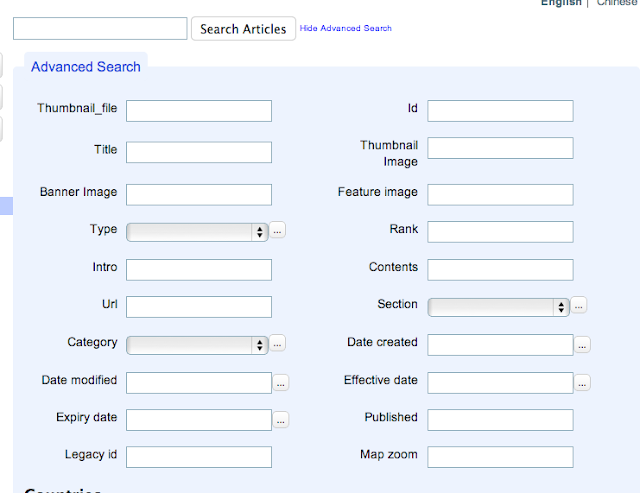 The user is able to type into a text field free form, and is assisted by auto-complete suggestions. If they select one of the auto-complete suggestions, then they will be adding a link to an existing record. If they don't choose one of the suggestions, they will be creating a new record in the related table and adding it to the relationship. Since a single string isn't sufficient (in most cases) to create a new record (e.g. which field should the string be saved in? ), you may need to implement that fieldname__addTag() method in the table delegate class to help guide how a tag should be added. 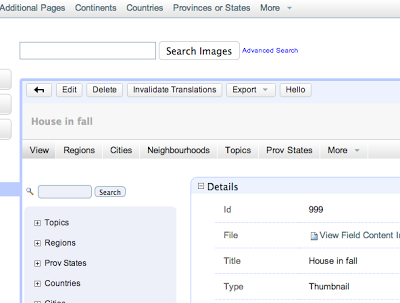 After the tag has been created, the user can double-click the tag to open the record's edit form and make further modifications. You'll need to be running Xataface 2.0 or higher. Create a directory named "modules" inside your application's folder, if it doesn't already exist. (e.g. /path/to/my/app/modules). When you are done you should have the tagger source in the directory modules/tagger. Ensure that you have modules/tagger/tagger.php, etc.... If not, you need to move it or rename it so that the path is correct. Add a [_modules] section to your application's conf.ini file, if it doesn't already exist. 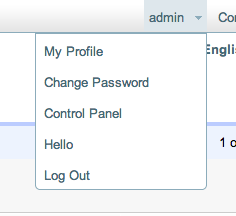 Now that the tagger module is installed, we can set up our n:m relationships to be editable via a tagger widget on the edit form of the parent record. 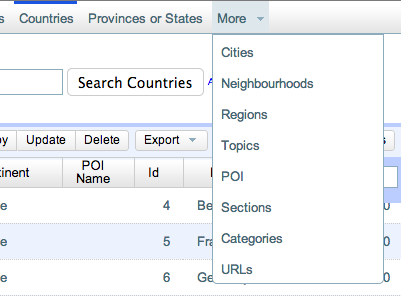 For example, suppose we have a database with a "cities" table and a "articles" table, where cities can be associated with multiple articles and vice-versa. I.e. There is an n:m relationship between cities and articles. You can see that this is a n:m relationship (among other things) because it makes use of a join table named articlecity to join them together. This says that we are creating a transient field (i.e. a field that doesn't really exist in the database, but should appear on the edit and new record forms) named "cities" using the "tagger" widget. The relationship directive sets the widget to work on the "cities" relationship. The tagger_label directive specifies which field from the "cities" table should be used as the text that is displayed in each tag. The "Cities" field rendered with the tagger widget. Auto-complete in tagger widget. If it finds any matching records in the related table, it will show them here. 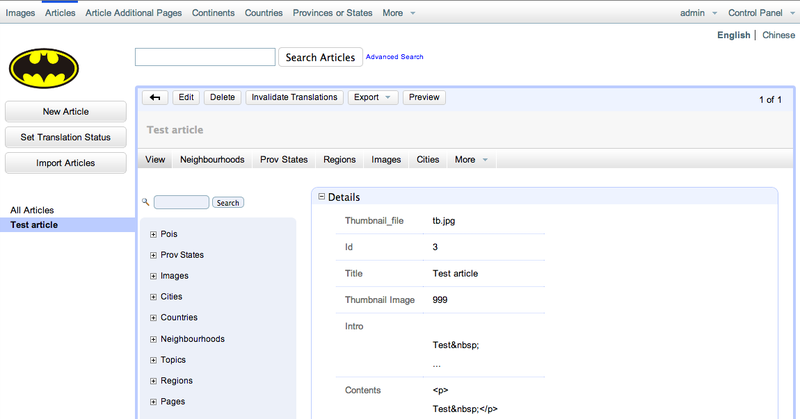 Implement the cities__addTag() method in the articles delegate class. 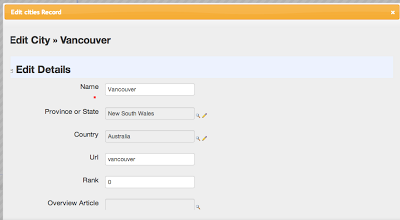 At this point (before implementing cities__addTag()), you should be able to add existing cities as tags without error. But if you try to enter a new city, you'll receive a little error indicator because it wasn't able to add the city to the cities table. 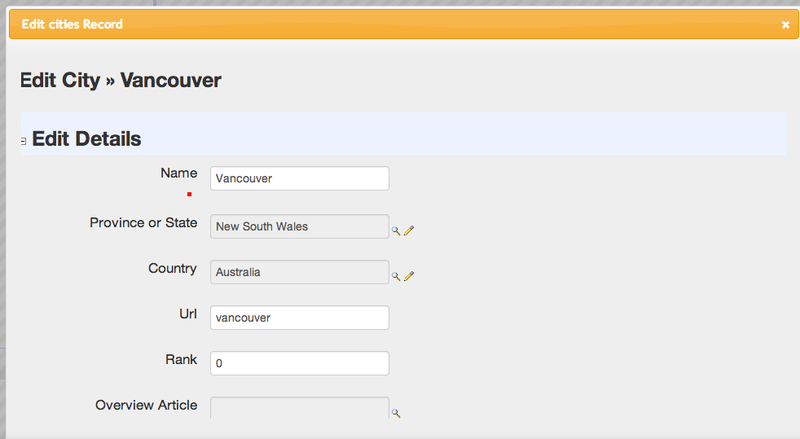 This is because the cities table has other NOT NULL fields that need to be filled in, other than the city name. E.g. it needs a province or state. This method takes the "article" record as the first parameter, and the string value of the tag to add as the 2nd parameter. In this case, we are creating a new Dataface_Record for the cities table with the name specified by $value, and a default province ID. Test out adding a new tag. 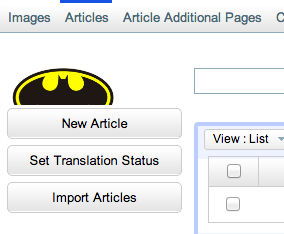 You can do this by clicking on "New Article", then start to type in the "Cities" field.